Devin Nunes gave Deputy Attorney General Rod Rosenstein a Tuesday deadline to hand over the evidence that Congress had subpoenaed. Rosenstein flat-out refused and will only allow Nunes and 7 other Congressional leaders look at the documents. He will not surrender them as the subpoena requires. Rod Rosenstein just broke the law and obstructed a Congressional investigation. And yet, the GOP leadership is refusing to allow a Contempt of Congress and Impeachment proceeding move forward. It's time to remove Rod Rosenstein and the rest of his Deep State accomplices! You must send your instant FaxBlast to Congress (below) and DEMAND they vote to hold Rod Rosenstein in Contempt and impeach him for his obstruction! House Intelligence Committee Chairman Devin Nunes gave Deputy Attorney General Rod Rosenstein a deadline. If he didn't comply with the lawful Congressional subpoena for Trump-Russia witch hunt documents, he would be held in Contempt for obstructing a Congressional investigation. Tuesday came and went and Rosenstein ignored the deadline entirely. He is still refusing to allow Congress to have copies of the evidence that has been subpoenaed. But on top of that, we are learning that Rod Rosenstein crossed another red line. Rosenstein intimidated Congressional staffers and threatened to start investigating them, which would bury them and their families in expensive legal fees. This is flat-out unacceptable. Not only is the Deputy Attorney General openly defying a lawful subpoena and obstructing a Congressional investigation, but he is threatening to weaponize the DOJ against Republican Congressional staffers. Rosenstein thinks he is above the law. He must be held in Contempt and removed from office entirely. You have a number of tools at your disposal. You have the power to compel testimony and to use the Sergeant in Arms to seize subpoenaed documents. Anyone who obstructs can be arrested and even jailed in cells beneath Congress. If government officials refuse to comply with subpoenas, they can be held in Contempt of Congress and removed from office entirely. 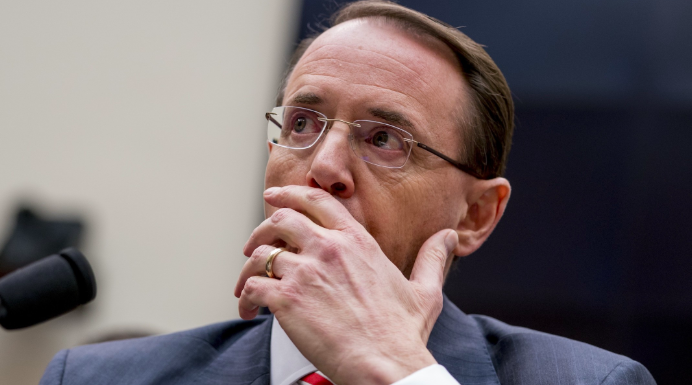 Rosenstein was given a deadline to comply with Congress' subpoena and he ignored it. Now, Congressional Leadership is trying to protect him from having to face the consequences for his obstruction. You must to reassert your authority and hold this criminal accountable! Congress has a lawful and constitutional oversight responsibility. When government officials abuse their power, it is up to you to hold them to account for their crimes. Here we have the Deputy Attorney General flagrantly defying a lawful subpoena. You must hold Rod Rosenstein in Contempt of Congress. If he still refuses to comply, then he must be impeached. If you are too afraid to fulfill your oversight responsibilities, We the People will replace you with someone who can.